Search for the latest condos for sale in East Pass Towers on Holiday Isle in Destin, FL. Learn more about this community with our local East Pass Towers Guide. Explore other coastal communities or other Holiday Isle condos and listings. 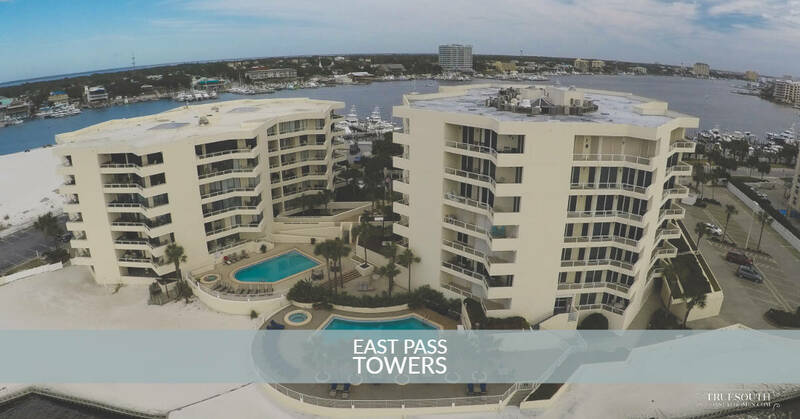 The East Pass Towers is a private gated condominium complex at the north end of Holiday Isle and the East Pass, the corridor from Destin to the Gulf of Mexico. These landmark buildings are the last development on Gulf Shore Drive before Norriego Point, a white sand peninsula between the East Pass and the Destin Harbor. Buyers should also consider condos for sale in Waterview Towers, its next-door neighbor. You will love taking in all the sunsets, fireworks, dolphins, boats and fabulous nighttime views of the harbor lights. It's also close to all the restaurants and shopping that Destin provides. The project is composed of 2 buildings, but they do have similarities and differences. Tower I (100 Gulf Shore Dr) is six stories and was constructed in 1986 while the newer Tower II (110 Gulf Shore Dr) is seven stories and was built in 1996. There is a mixture of 2- and 3-bedroom floor plans. Interiors are bright with floor-to-ceiling windows, providing amazing unobstructed panoramic views of the Gulf, East Pass, and the Destin Harbor. Project amenities include two seasonally heated waterfront pools and outdoor spas, beach access and exercise rooms. Unique to Tower II is a well-furnished club room with a full kitchen, and its exercise room has its own indoor spa. About half the units in Tower I may be sold with a deeded reserved covered parking. Tower II has covered parking, but there are also six coveted deeded garages that may be sold. Deep water slips in the marina are deed. Investors looking for income should consider Tower I which allows for short-term rentals. Tower II does not allow short term rentals. Owners in both towers may own pets, but be sure to inquire of the precise details. Click here for directions: 100 Gulf Shore Drive, Destin, FL. The listings on this page include condos in East Pass Towers on Holiday Isle in Destin, Florida. If you’re interested in scheduling a showing or learning more about any one of these homes, simply fill in your contact information and click the “Request More Info” button. Our team is here to provide you with any information you need, including disclosures, the sales history of a property and nearby market data.